GapFit Seamless Low Support Plunge Sports Bra // These are THE best bras. They are comfortable enough to sleep in, wear around the house and for low impact exercise. I can totally see myself using these for nursing bras, too, down the road. Gap Vintage Soft Maternity Pullover Sweatshirt // So comfortable/cute and doesn’t look like maternity. I’ve been wearing this for weeks now! Gap Pure Body Modal Joggers // I’ve owned these for years and LOVE them pregnant and not pregnant. Just bought two more pairs because my older pairs were getting worn out. The Be Brand Sweatshirts // Love these sweatshirts and long sleeved shirts for super comfy lounge wear that’s cute enough to wear out and about. I’ve bought a bunch of dresses recently from H&M for Beautycounter functions and been really impressed with their cut and fit! I haven’t been getting maternity items, just gravitating toward looser styles. I have this dress in black and a dress in leopard that I can’t find on the site anymore and I love them both. I also think I’ll be making more purchases from Carly Jean Los Angeles because their flowy styles are perfect for pregnancy and postpartum recovery. I just got the Stella Half Sleeve Dress in black and will probably buy another dress or two in a similar style for being majorly pregnant in the summer months. I also got the Addison Jumpsuit and a few of their awesome tunic tops. I have never owned a proper maternity swimsuit while pregnant because my babies were born in February and May. 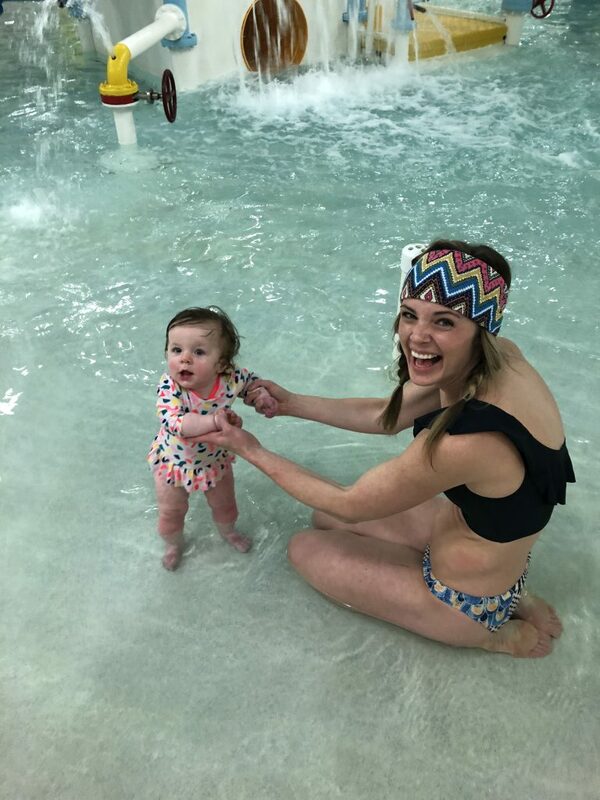 I never really needed to wear one while pregnant – barring a few trips to the indoor pool – so I just made do with what I had. Knowing I’m not due until August 10th, I thought it was a good idea to get my hands on a maternity suit for the summer. I found THIS ONE from Gap and I can’t tell you how much I love it. I have the black version and it fits well and is super comfy! I have been a Rent the Runway Unlimited member for a handful of months because I had a bunch of Q1 work travel on the calendar and wanted to make sure I had the right outfits. It’s an economical and eco friendly way to shop for items that you might only wear once. Rather than buying said items, you can pay a monthly subscription and simply “check out” four items at a time, returning them whenever you want for another four items. It’s been especially helpful during this transition time when I don’t really want to invest in nicer pieces in sizes that won’t fit down the road. For a full round-up of the jeans I have loved this pregnancy, reference THIS POST. Well, we are here! Nearly to the point where Collins has been out in the world as long as she was in my tummy. I can’t believe that she is already so big and so far into her first year of life. The second baby’s life goes even faster than the first and I am, as always, equal parts delighted and dismayed seeing this little kiddo of mine grow and change. It’s so sweet, it’s so sad, it’s bittersweet. But truly, it’s a JOY to see this little girl grow and the best part is seeing her develop a relationship with her sister and start to play together. So, nine months feels like a big milestone in the postpartum journey. Or at least it has for me. It tends to be the point where I feel like it’s reasonable to want to look and feel like yourself again, to have given your body time to heal and adjust and to begin to really regain your former strength, fitness and sense of self to some degree. That’s not to say that things are totally back to “normal” (hello, saggy tummy skin!) but what is normal anyway? Mentally I’m in a really great place right now. I still have my moments of insecurity and issues with body confidence, but I’ve been working hard to safeguard and protect my mind from those assaults and, as Ainsley has gotten older, I’ve been VERY careful about what I say around her as it relates to my body during this postpartum journey since she is getting old enough to understand what I’m saying and how I relate to my body. She is frequently by my side during workouts and we talk a lot about exercising to make our bodies STRONG and capable and healthy, not skinny, thin, look good, etc. I’ve said this from the beginning, but working out for me in this postpartum phase has been critical to helping me have enough physical energy to be a good mom day in and day out. I’m so thankful for the ability and gift of being able to move my body and of what my body has done in the last three years (two babies, two postpartum journeys, etc.) and that has given me a newfound respect and admiration for my physical body that I didn’t have before kids. When I look back at the last 9 months, what I see is a lot of really hard work. Hard mental work – learning to pray for patience, grace, forgiveness. 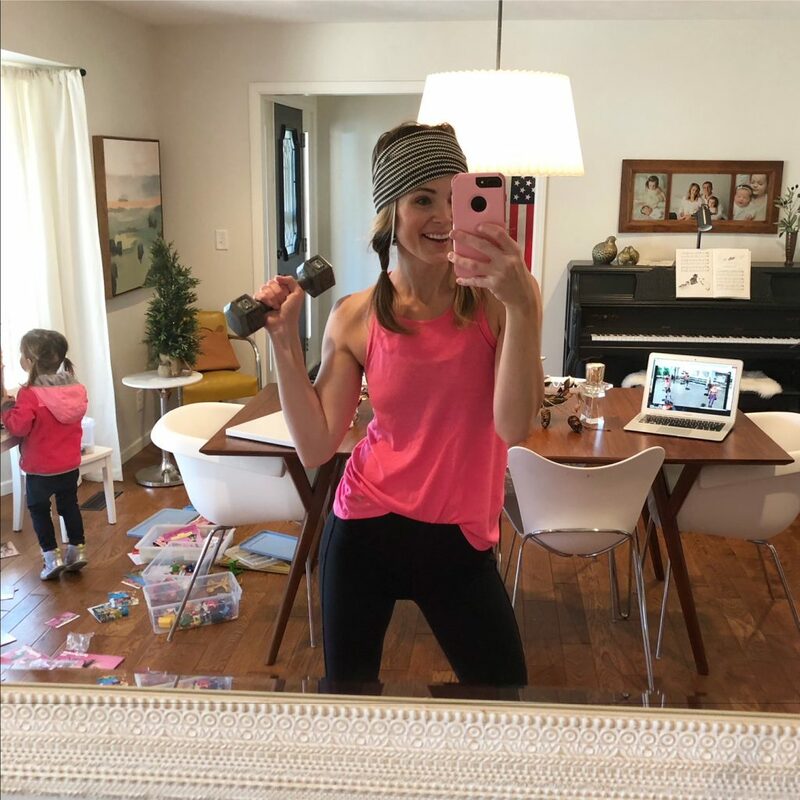 Hard physical work – sleep deprivation, carrying toddlers and babies (sometimes simultaneously), challenging physical workouts day in and day out to get back to my pre-baby fitness level. But like all things that are difficult, it’s incredibly gratifying, too. Did I want to fit back into my jeans? Absolutely. But really, I just wanted to be able to feel like myself again, to set a good example for my girls about what self-care and dedication looks like, and to be able to be in a place where I could give my best self to my family. And I know that when I feel mentally and physically fit, I’m a better wife and mom, and everyone in our family benefits from that. Now, 9 months into this journey, I think I would say that I’m moving out of recovery mode and into fitness maintenance and growth mode. Though I definitely am still paying careful attention to rebuilding proper core and pelvic floor strength, both of which I think are very overlooked as part of the recovery process. Because I’ve gotten a lot of questions about what workouts I’m doing or have done these last 9 months, I have to give a huge shout-out to Beachbody on Demand, which has been a saving grace during this time. I don’t so any of the eating plans associated with the workouts, because like I’ve said before, I’ve gotten to a good place knowing what works for my body intuitively, but the workouts have my heart forever and ever. Early in the postpartum journey I did 21 Day Fix, later moving into T25 and 21 Day Fix Extreme and now I’m 22 days into the 80 Day Obsession, which I’m LOVING. The workouts are longer than I typically do, but they have really pushed me and have been incredibly fun. Joe and I also try to do Crossfit together a couple Saturdays per month – he goes to Crossfit four days during the weekday but I just go with him as a drop-in occasionally. My best advice if you’re feeling out of the loop of exercise postpartum is to start somewhere small. Go on long walks with the baby in a stroller, do a short high intensity workout (there are lots of good free options online) or even 15 minutes of strength training with some weights at home. Give you body time to heal appropriately and ease back into things. It’s easy to think that 15 minutes doesn’t make a difference but a little exercise is better than nothing and your body will thank you. A few other helpful links to share with you as it relates to supplements postpartum, in case you want to know! Smoothies // I rotate between Vegan Vanilla Shakeology and Vega Protein & Greens for at least one smoothie per day. When life is busy, making a smoothie is really just the best way to pack in a bunch of nutrition quickly. Supplements // I have continued to take my Garden of Life Once Daily Prenatal and also take the Garden of Life Women’s Probiotic. I LOVE Garden of Life products and can’t speak highly enough about the company and the quality of their supplements. We also take the Kids Probiotic for Ainsley and she gets so excited to take it each day! I also take the Plexus BioCleanse product, which I think was tremendously helpful in the postpartum period to promote regularity and reduce some of the gas and bloating that can happen while your hormones adjust and recalibrate. I’ve talked a lot about hair on Espresso and Cream over the years. About a year ago, I posted this while I was contemplating what to do with my hair. It was brittle, breaking off like crazy, and incredibly unhealthy, despite being 1 1/2 years postpartum and pregnant with another baby. Babies, man, they are hard on your hair! Less than a year ago shortly after writing that post, I decided to chop my hair. My stylist agreed that there really wasn’t much else I could do to salvage my hair and starting fresh might be the best (only?) option. After chopping my hair I committed myself to growing my hair back out in the healthiest way possible. It wasn’t until yesterday, when I looked at my new color and how long my hair has gotten in less than a year, that I realized how much healthier my hair is now than when I chopped it all off. 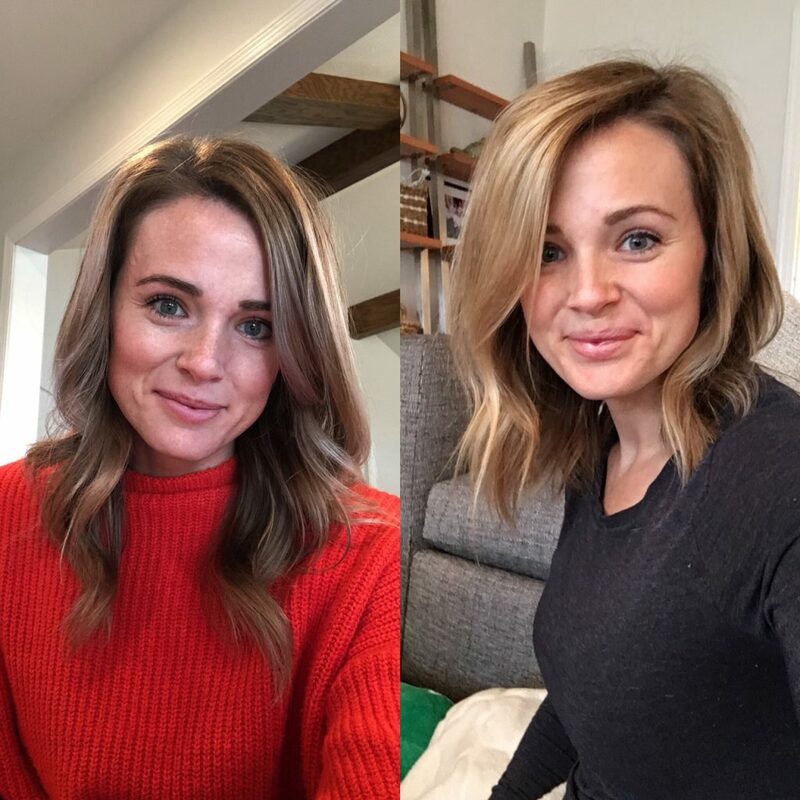 I switched over to Beautycounter’s Volume & Shape Shampoo, Conditioner and Volumizing Mist when they launched their new salon-quality hair care products this spring. I fell head over heels for the V&S collection from the first weeks I used it and haven’t looked back. What I learned about traditional hair care is that a lot of the products make your hair feel healthy rather than making your hair truly healthy. Beautycounter’s line doesn’t contain sulfates, silicone or SLS and uses PureFoam Cleansing Technology to get the amazing foam without sacrificing safety. My hair has never felt so clean, so shiny, so truly healthy and strong! I still take my prenatal vitamins on the regular even after having a baby. There are a lot of “hair growth” vitamins out there, but many of them contain cheap biotin and b-vitamins that aren’t the bio-available variety. Don’t settle for cheap vitamins. If you’re going to take them, make sure your vitamin contains methylated folate (NOT folic acid) and that they are good quality. My favorite prenatals come from Seeking Health or Garden of Life. I take a collagen supplement most days to help my skin and hair from the inside out. My favorite collagen is from Vital Proteins and can be bought on Amazon! If you’re curious to learn more about why collagen is good for your skin and hair, this article does a good job breaking it down. I was also struggling terribly with itchy scalp when my hair was at its worst. I read enough scary articles to convince me that perhaps dry shampoo wasn’t helping my hair but was, in fact, hurting it and contributing to my itchy scalp and hair loss issues. The first few weeks to a month my hair looked greasier between washes, but now that I’ve gone without it for nearly a year, I find that my hair doesn’t need it – even if I only wash it a few times per week. When I really need to absorb excess oil on my hair between washes I use Beautycounter’s Mattify Powder on my hair and brush it on where needed. Does the trick well! I hope this helps someone who may be in the same spot I was in! It’s SO frustrating to deal with hair issues and the two year long saga of my hair has really been a learning experience for me. I can’t believe we are here, six months postpartum with Collins! I remember thinking about when I would write a six month postpartum wellness/fitness update and thinking it seemed SO far out, but time has passed so quickly. My hope in writing these updates is that I can be an encouragement to those who are perhaps not quite so far along in their postpartum recovery. I remember looking at my body in the hospital and being both in awe of what it was capable of and in dismay because I felt so very unlike myself. Recently, I’ve learned a lot about what it means to give your body grace in the transition and appreciate small victories along the way. Months three through six have been pretty uneventful! After making the switch to formula I really felt an overall emotional leveling out and an improvement in my mental health as we finally got into a good groove with sleep, naps, and general schedule. Although I try not to live and die by the schedule, I find having predictability in our routine helps our whole family function better. For me a schedule actually creates MORE freedom in my days. I’ve also felt myself making huge strides in terms of my overall body confidence and satisfaction – something that I’ve struggled with on and off for years. For the first time in a very very long time I feel so good in my own skin. Strong, healthy, capable. And while I know there are things about my body that aren’t perfect, becoming a mom the second time around has really pushed me past focusing on the imperfections and embracing the here and now in regards to my body. In terms of actual fitness, around the 5 month mark I started to really feel like I was back in pre-baby shape in terms of my fitness and endurance. As you probably remember, I started working out about two weeks postpartum with Collins and it’s been a LOT of hard work and sweat equity over the past five+ months. Last week I ran my first 5K post baby – and my fastest ever time. And although I felt like I wanted to puke after, it was fun to see how far my body has come in the last five months. I’ve gotten a lot of questions on Instagram about what workouts I’ve been doing. I run once or twice per week when the weather is nice, go on lots of long walks with the girls and doing workouts at home with my Beachbody on Demand subscription. I’ve done a lot of different workouts through BOD – 21 Day Fix, 21 Day Fix Extreme, Shaun Week, Shift Shop, 22 Min Hard Corps, etc. – but my favorite continues to be T25. The workouts are hard, fast-paced and can be done in 25 minutes. That said, I do try to mix things up so my body doesn’t get too comfortable with any one workout. And I think I’ll be doing the new 80 Day Obsession when it launches in January! Since I’m no longer breastfeeding, and haven’t been for quite some time, I am able to eat with a little less thought about calories and overall intake. I had been curious about intermittent fasting for quite some time but it wasn’t good timing while pregnant and nursing, obviously. I’ve been dabbling in intermittent fasting for over a month now and have LOVED it. If you’re curious on learning more about the science behind IF, I would recommend this podcast to start. This article is also a good intro to the concept. Basically, I try to fast for somewhere between 14 and 16 hours per day, with a minimum of 12 hours. I’ve tried not to be too legalistic about any of it, because life happens, but it’s really encouraged me to NOT mindlessly snack or eat after dinner. Additionally, as an early riser, I was finding that I would eat a snack after dinner, around 8:30 pm and then get up and have breakfast early, around 5 or 6 am, which meant my body’s digestive system wasn’t really resting much each day. The more I read about IF, the more convinced I was it was worth trying. And so far so good! I’ve noticed that my body has leaned out a bit, I have more energy and it feels good to give my system time to rest without eating around the clock. The number of questions I’ve gotten on Instagram about formula feeding have been too many to count. It appears that when you talk openly and honestly about your decision to stop breastfeeding and switching to formula, people send their questions in large quantities. I’m so thankful to be able to help moms who are struggling with the decision, wanting to know it’s OK to formula feed, and help squash any of the mom guilt associated with formula feeding these days. As most of you know, I had a tumultuous feeding journey with Ainsley and wrote this post about the topic. The second time around, I was really reluctant to breast feed at all and wrote another post on the topic when I was feeling very conflicted about making the switch. Breastfeeding made me feel crazy. I don’t say that lightly, it really did do a number on me emotionally, and I remembered how once I weaned with Ainsley it was as if the sun started shining again and I felt like myself. I wanted to feel that way this time around. I am a modest person, and I didn’t see myself getting comfortable with public feedings. Maybe over time I would have gotten more comfortable with feeding in public, but to me, it felt daunting always wondering when/where I would be when Collins needed to eat. Would I be able to find privacy? Should I just stay at home around all feeding times? What would I wear that could accommodate feeding in public? I didn’t want to. This sounds incredibly selfish and I struggled with that the most. Shouldn’t I be willing to sacrifice everything for my baby? Yes. And no. I remembered all the effort that went into getting pregnant with Collins. The acupuncture appointments, doctor’s visits, preceding miscarriage, 30 weeks of shots in my booty, pills and supplements. I came to peace with the fact that I had sacrificed my body for over a year and that it was OK to draw the line somewhere, to regain some piece of myself in my own body. I had a living, breathing example of how you can feed a child formula and they can thrive. Having the perspective of having done this before really helped give me the freedom and confidence to wean. So that’s that! I don’t feel the need to justify my decision to anyone, but for the sake of this post I wanted to explain. Because a lot of the posts you read on the topic are from women who can’t breastfeed – who struggle with supply issues or who have children who aren’t gaining weight or won’t latch – and go through every effort to make it work but physically it just isn’t working. And that’s not my story. Maybe it’s not yours. And I want you to know that it’s okay to stop breastfeeding even when everything is going really well. Some of you asked me to address the stigma of formula feeding and how I deal with that. The short answer? I don’t! In today’s “breast is best” culture there is significant stigma around formula feeding and I can’t see why people feel the need to justify their choice not to breastfeed, but for me I just didn’t let that worry seep into my mind. The day I made the decision to wean I felt SO much freedom and peace knowing I made the right decision for myself and my entire family, and that was enough to override the thoughts and/or judgements of anyone else. One of the questions that’s been asked most often is what formula we are using. I wish I could say that, in true crunchy fashion, we are using the best, most expensive, most organic option around. But we aren’t. I aimed to make a decision based both on quality, price, and convenience. We are using Similac Pro Sensitive for Collins and she has done really well with it! I went with the sensitive formula as a precaution since she had a sensitive tummy during the first few weeks she was breastfeeding and I didn’t want to rock the boat, though I’m sure she would do just fine on the regular formula. I’ve heard awesome things about the Holle brand of formula out of Europe (like many things, they are ahead of the health and wellness curve here) but price, ease of getting it at my local Target, etc. really kept me from going that route. We use these bottles. And this article is helpful as a guide for how much to feed your formula fed baby. I’m not sure if this is true, but if Collins is consistently draining her bottles at every feeding for a couple days, then that’s when I increase how much she is taking at each feed. I do try and track how much she eats in any given day make sure she isn’t eating too much or too little but generally I let hunger be the guide. Everyone has different opinions about baby feeding schedules, and while we do follow a pretty nice little schedule, during the early weeks and months Collins did like to nurse for comfort. I was worried how we would get through the fussy hours of the evening if comfort nursing wasn’t an option. Introducing a pacifier was a really easy way around that. I would cuddle Collins close and hold a paci in when she wanted to be comforted and it worked like a charm – and I didn’t have to be a human pacifier which was an even greater benefit. I did some reading on the topic of cluster feeding, and some experts have indicated that cluster feeding can actually make stomach issues worse in fussy newborns and babies because it overstimulates their digestive system, causing more gas, which causes more fussiness, which causes more comfort nursing. Basically a cycle that never ends! I had an oversupply issue and overactive letdown, which really compounded the tummy issues Collins was having. Almost as soon as we switched over to bottles, Collins was happier and less fussy, and I was a lot less stressed out. I spent a lot of unnecessary time thinking about my diet, if that was causing tummy issues, what I was eating or not eating, etc. I don’t think any of that was to blame for Collins’s tummy troubles early on, but having the control of formula rather than the variable of breast milk was a relief. Some of you asked about schedules vs. feeding on demand. Whether we formula fed or breast fed, we didn’t really do much “on demand” feeding and followed a 3-hour schedule from the start with both girls. Now that Collins is a bit older we’re stretching to 3 1/2 to 4 hours between feeds. We have found that our girls, and our whole family, really thrives on a predictable schedule. Do I get upset or out of shape if things don’t go perfect? I try not to! And trust me we have our days, but following “eat, play, sleep” a la Babywise really helps me to know that she is getting full feeds when she is awake an alert and if she is fussy outside of her feeds then I can problem solve other causes. This is one area where I don’t see much difference between breast or bottle, especially if you are following and eat-play-sleep routine and encouraging full feeds. In our house, we avoid all specialty things that would get our girls accustomed to something we can’t recreate on the go, which means no bottle warmers or water warmed to the perfect temperature or baby wipe warmers, etc. I can’t imagine taking a road trip and having a baby that required her milk be warm. How does that even work?! I’m sure there are plenty of moms who make it work, but we just got both girls used to room temp or slightly cold water for their bottles from the start and they’ve taken it that way ever since! YOU know what is best for you and your family, momma. Deep down in your mom gut, you know. If that’s breastfeeding until your child is two, then go, momma, go! And if you decide not to breastfeed at all, that’s more than OK, too. As moms I genuinely believe that we are all just trying to make the best decisions for our families, and because we are all unique individuals what is right is also going to vary greatly. I hope that we can continue to build one another up rather than tear each other down.